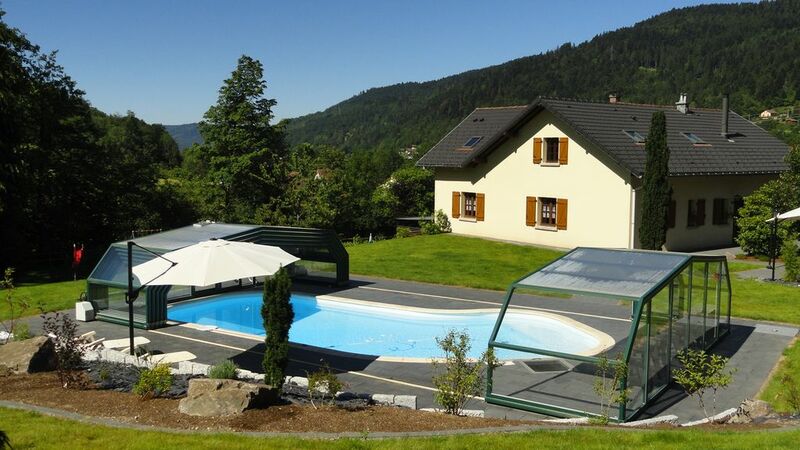 Located in Le Ménil, a small Vosgien village of 1100 inhabitants "Le Clos du Mapré" welcomes you in a green setting, surrounded by mountains. In this haven of peace, come and enjoy the calm and discover this region with many walks. fully independent with entrance and private parking, you will discover a beautiful spacious and comfortable apartment in the upstairs. You will enjoy the outdoor terrace next to the pool with garden furniture, barbecue and sun loungers. The swimming pool is in service from May to September and complies with the regulations applicable to private pools for collective use. It is shared with another gite. The pool is covered and discoverable by you, allowing swimming in all weathers. It is heated by solar panels whose temperature is regulated according to the meteorological conditions. It is included in the rental price. Access to the pool has been specially designed to allow younger children to play with confidence in the presence of their parents. You can also benefit from a relaxation area Spa and Hammam, open from September to May, independent of the house, located a few meters away, created and personalized in natural stones which together will bring you relaxation and relaxation assured for your pure happiness. The relaxation area is open from September to May, privileging the pool in summer. Extra charges will be required for the relaxation area. as well as local gastronomy in many farmhouse inns and restaurants nearby. Ski slopes Alpin and bottom nearby: Ventron, Lispach, La Bresse., Rouge Gazon .. The bathroom is equipped with a shower and a bath with washing machine and dryer with feet + dryer outside The toilets are independent. At your disposal: baby bed, CHICO reclining high chair from birth and BB bath on request. We were a party of 7; grandparents, parents, two boys (4 & 2), and a dog. The accommodation was right for us, with all rooms being plenty large enough. A slight drawback was the shortage of enough sofas/armchairs in the lounge, on the odd occasions we were all there. The kitchen was very well equipped and we could prepare any sort of meal. Another slight drawback was the need to negotiate the stairs to get outside with the food, should you want to eat there - all the accommodation is on the first floor, accessed via private stairs. On arrival the place was in excellent condition and perfectly clean. Denis and Francoise were very welcoming, but perhaps could have left the (quite lengthy) tour and explanations of the property until we had got over the journey. Contrary to the property description, English is not spoken by either of them . However, they are most charming and proved more like friends than landlords as hosts. I misunderstood the description in relation to the use of the pool (a very good facility it was too); it is shared with the occupants of another, larger, property. This proved to be no great problem to us as most of the time we wanted to use it we had it all to ourselves, but I could see that it would be too small if everyone wanted to be there at the same time. Nevertheless, we found it excellent. Shopping is convenient, with a baker, butcher and "corner" shop in the village, and an Intermarche and Lidl a few minutes away towards Le Thillot (where there are many, many shops). The Intermarche is open on Sunday mornings, which is great for Saturday travellers. There are good places to eat at every turn; one recommended by Denis and Francoise for a special dinner (a wedding anniversary) was Auberge des Fontaine in nearby St. Maurice sur Moselle.. It proved an excellent recommendation. Being a mountain area, the main attraction is the scenery so you need good weather. We had a few rainy days but could still use the pool. When it was nice and sunny it was beautiful. There are many walks, and short and longer drives on roads so quiet as to be a pleasure to drive them. The Alsace wine towns are within easy reach and the Route des Cretes is great. There is a pleasant short walk around The Ballon D'Alsace, as well as The Grand Ballon. This was a lovely holiday in a beautiful place, enhanced by the hospitality of the owners. I would not hesitate to recommend it to others. Un grand merci à nos hôtes d’avoir fait le choix de notre gîte et d’avoir accordé un instant pour rédiger cette appréciation. Nous avons eu beaucoup de plaisir à les accueillir, à échanger nos conversations et à apporter nos conseils afin de leur faire découvrir notre belle région, les Vosges. Concernant l’aménagement du salon, celui-ci est composé d’un canapé permettant une assise de 4 personnes, d’un pouf intégré à cette configuration et de nombreuses chaises disponibles dans les différentes pièces du gîte. We spent two fantastic weeks at the house. The apartment looks great, is very spacious, very clean and very well equipped. The pool is brilliant - with the roof it can be used in cooler weather or opened up electronically in the sun. The gardens are great for kids with badminton, table tennis, swings and enough room for a game of football. The location is superb. Easy to find - removing the stress of arrival and ideally situated for walks in the hills and forests. The walks are steep in places but the views from the tops of the hills are spectacular and well worth the effort. There's a supermarket a few minutes down the road at Le Thillot and a bakers, butchers and newsagents within walking distance in Le Menil village. Denis and Francoise gave us plenty of ideas for days out and we visited the market at La Bresse, the lake at Gerardmer and the beautiful town of Colmar. Besides all that Denis and Francoise are great hosts and always on hand if needed. We holiday in France most years and the house, the location and the hosts are just about as good as it gets. We had a truly excellent holiday and I'd recommend it to anyone looking for a relaxing break in a beautiful place. Au bord d'un petit ru et face aux montagnes encore enneigées, nous avons encore une fois apprécié l'accueil chaleureux de Denis et Françoise, toujours aux petits soins pour leurs hôtes. L'appartement a encore été amélioré (nouvelles fenêtres, nouveau grille-pain et j'en passe...) et le clos sécurisé par une jolie barrière et un magnifique portail. Grâce au beau temps, nous avons pu jouer au ping-pong, faire de la balançoire et de la pétanque. Encore un peu tôt en revanche pour profiter de la piscine couverte mais le Spa et le Sauna sont toujours un bonheur en fin de journée après quelques descentes sur les pistes du Honeck à quelques minutes. Merci encore à tous les deux. Hâte de revenir l'an prochain. Très sensible à la description de notre gîte nous remercions nos hôtes de l’instant qu’ils nous ont accordé en déposant une appréciation. Les différents critères énoncés correspondent à l’objectif qualité que nous souhaitons vous faire partager. Encore merci et toujours beaucoup de plaisir à vous revoir au Clos du Mapré. Très bon accueil des propriétaires, L'appartement très bien tenu, rien ne manque, très spacieux pour 6 personnes, très calme. Dans un environnement magnifique et reposant. Madame et Monsieur Pernot sont toujours disponibles et soucieux de nous être agréable. Si l'occasion se présente nous y retournerons avec grand plaisir. Un sejour très agréable. Des propriétaires très sympathiques et un accueil très chaleureux. Non seulement la situation de l'appartement est parfaite, entouré d'un magnifique paysage, d'une propreté impeccable et un confort parfait. Dans un coin très calme et reposant, toutes les commodités à disposition. Le moindre détail a été pensé. Un intérieur de grande qualité. C'est certain nous y reviendrons. Es hat uns sehr gut gefallen, Danke! In the heart of the High Vosges, near Gerardmer, La Bresse, Balloon of Alsace, the Alsace wine route, many hiking opportunities are available to you; as well as multiple sporting activities (free flight, horse riding, fishing, mountain biking, go-karting, quad, summer toboggan, tree climbing, amusement parks, museums ...) and cultural (local crafts: confectionery, sabotery, breeding of goats,...). You will discover the local gastronomy in the restaurants and inns of Menil as well as many farm inns and by visiting the local markets.